Clear Weather After Snow at Nihonbashi Bridge features a snowy scene at Nihonbashi Bridge(日本橋) in the city of Edo, now known as Tokyo. Mount Fuji appears in the background while a public square and thriving market, selling seafood and produce, appear to the west. Nihonbashi Pier, which also appears in this print, was one of the biggest kashi (河岸) or pier districts in the city, specializing in seafood. The lower class lived in crowded conditions at home, so public areas were often lively, particularly during the daytime. This placid and serene depiction of Nihonbashi district in winter belies what was a bustling center of trade and commerce central to the region’s economy. Shogun Tokugawa Ieyasu established his capital at Edo in 1590, and Nihonbashi was one of the first areas to be settled. Spanning the Nihonbashi River, the eponymously named bridge was built in 1603 and served as the starting point for the five major roads that connected Edo to the rest of Japan. As the point from which all distances were measured, Nihonbashi Bridge literally and figuratively became the country’s center. Overtime, it came to symbolize Edo as a unifying force for all of Japan. 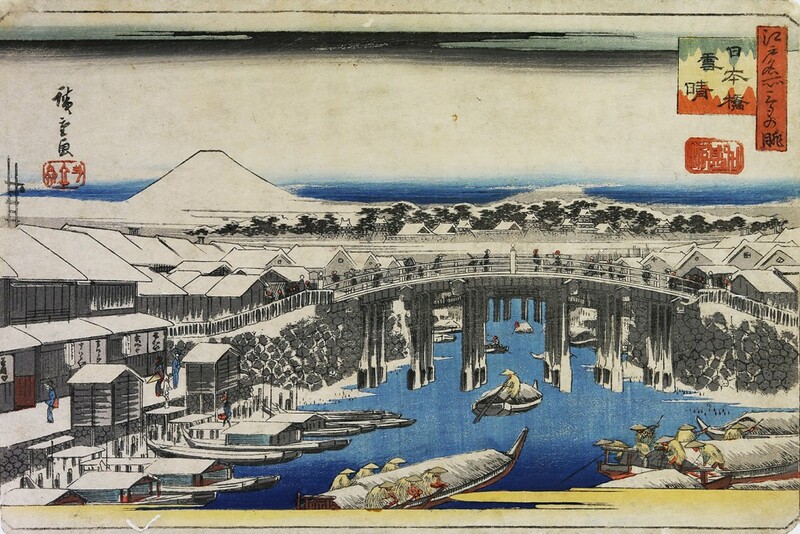 Rebuilt in stone during the Meiji Era in 1911, Nihonbashi Bridge no longer exists in the form depicted here; however, its former incarnation lives on in myriad woodblock prints. Ando Hiroshige, also known as Utagawa Hiroshige, is known for his woodblock prints depicting active weather conditions, thus his reputation as “the artist of rain, snow, and mist.” This print is part of his series Three Views of Famous Places in Edo. “The Nihonbashi Pier District”, us-japan.org. “Why Is Nihonbashi Called Nihonbashi?”, WordPress, markystar.wordpress.com. “Ando Hiroshige The Tokaido Road”, The Woodblock Prints of Ando Hiroshige, hiroshige.org.uk. “Nihonbashi Bridge”, Tokyo Metropolitan Board of Education, syougai.metro.tokyo.jp. J. Noel Chiappa, “Utagawa Hiroshige”, MIT, mercury.lcs.mit.edu.